If my younger self could meet me now, she’d be absolutely amazed that I am eating cabbage on a near daily basis. Willingly. I grew up loathing cabbage, Brussels sprouts and broccoli. All three are now my culinary best friends. It’s amazing how tastebuds improve over time, or perhaps I’m just better at cooking them than my mum was? Who knows, but it never ceases to amaze me that I am happily chowing down on a big bowl of cabbage for lunch. This may not look like much, but let me assure you that it is delicious. 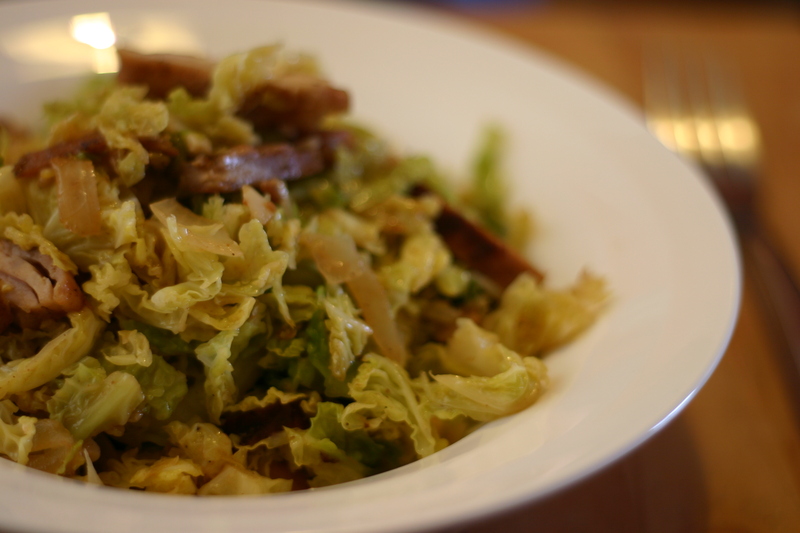 A tough of butter, a little onion and some decent meat turn cabbage into a lunchtime feast. I grill up a tray of chicken thighs each week for easy lunches–my little boy loves them–and they are awesome in this, but it works beautifully with leftover brisket, diced ham, whatever. It’s all good, and good for you too. Heat a large sautee pan over medium heat. Add butter and when melted add the sliced onion and saute until almost translucent. Add the garlic and cook for another minute until fragrant. Add the shredded meat to the pan and continue to cook for a couple of minutes until the meat is starting to take on colour and crisp around the edges. Toss the shredded cabbage into the pan, pour in about 50ml of stock, stir and put the lid on the pan. Cook for 5 minutes. The cabbage should be nicely wilted. Fish a piece out and test it to make sure it is soft enough for your taste and adjust seasoning if necessary. So simple, yet absolutely delicious – I’m sure.